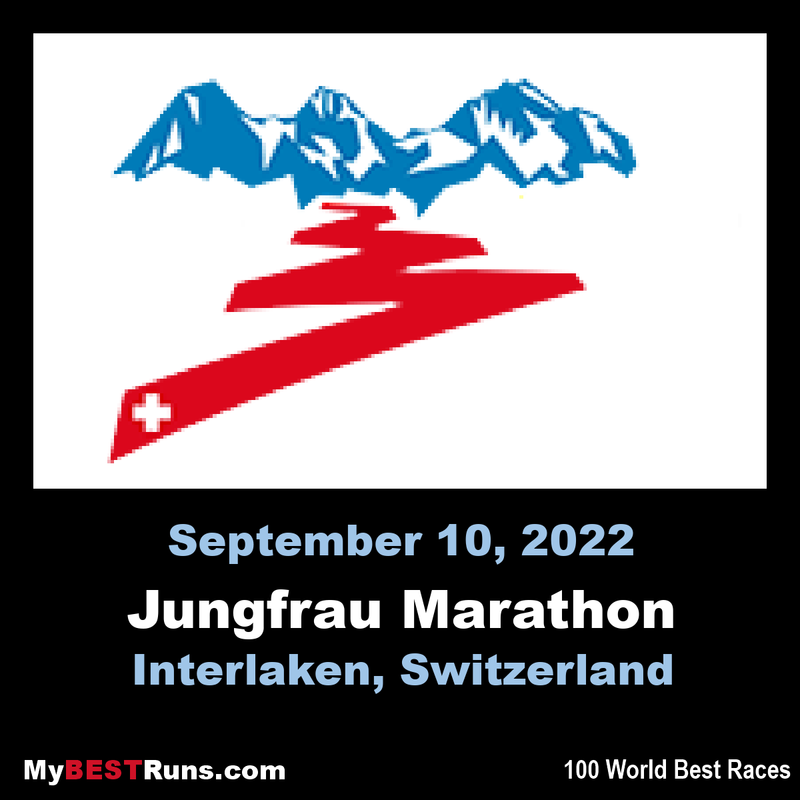 The Jungfrau-Marathon presents the most beautiful marathon course in the world - marvelous mountains scenery and the excellent change of the landscape between the start in Interlaken and the finish on Kleine Scheidegg. The difference in altitude of 1829 meter (6000 feet) is a challenge for everybody. There is no Marathon in Europe with such great dimensions. Eiger, Mönch and Jungfrau the most famous mountains peaks of the Alps loom majestically over the course! Wilson Kipsang, former marathon world record holder and a My Best Runs scout, picked this marathon as one of his favs. After checking it out and getting some comments from runners who have completed it, I can see why this is known as one of the most beautiful marathon courses in the world. I know I have put it on my Bucket List. The first 10 km of the courseis flat. 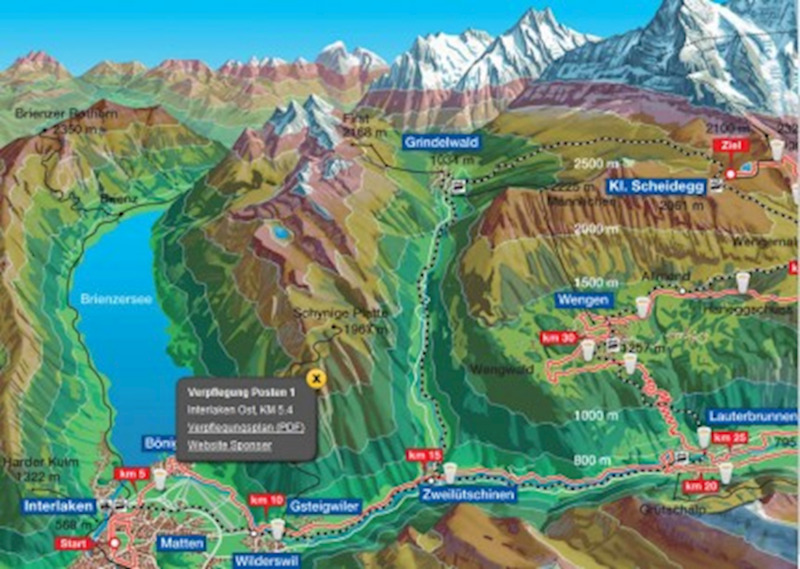 The race begins in central Interlaken and circles around the town centre before moving east to Bönigen, where runners briefly run along the shore of Lake Brienz. The race proceeds southwards to Wilderswil at the 10km mark. From there the course heads upward through Zweilütschinen (at 15km) to Lauterbrunnen (at 20km). The course loops for 5km south of the town before returning to Lauterbrunnen and then heading eastward up the alpside. It is at this point that the race is steepest, zigzagging up the hillside and climbing 450m in the 5km to Wengen. 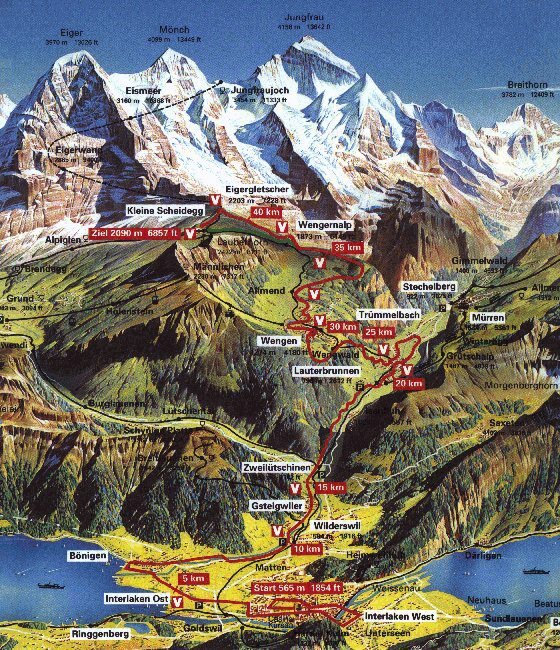 The course heads southeast and relentlessly upward over the Wengernalp, turning east and then northeast beneath the Eiger toward the finish. It reaches its highest point of 7,234 feet around the 40km point, and then heads steeply downhill for the last kilometre to the finish at Kleine Scheidegg at an altitude of 2061m.